Steve Wozniak predicts that the Cloud is going to be a “horrendous” place in the near future. We tend to agree, if Woz is referring to large players in the cloud market who attract ire. Amazon, Apple, Dropbox, and Google have all been in the news cycle this week due to hacked or breached data that is stored in their secure clouds. The only Goliath spared the doom and gloom is, ironically, Microsoft. Mat Honan’s situation has become the talk of the town. But for every Honan, there are many others whose cloud security plight doesn’t reach mainstream news. None of this is new. Hacked clouds and online security breaches have been happening since Salesforce.com made “cloud” armchair language. However, the more dust that flies due to breaches, the harder it becomes for business decision makers to move their enterprises to the cloud. Imagine how many companies were close to migrating their enterprise to the cloud last week, only to have pulled the reigns and wait for a better day when they can look their customers in the eye. What we need is the emergence of private clouds that are not run by the Goliaths who have a financially vested interest to mine, sell, advertise, or otherwise disclose your data. Small private turnkey clouds are too mundane to catch the ire of hackers. Think of the Windows OS virus magnet compared to the fledgling Mac OS X in the early days. Fewer hackers went after OS X because Apple wasn’t Goliath (oh the irony) and didn’t have the aura of world dominance. Our society thrives on small underdogs who fight to provide a more honest experience to people. Where are the honest private clouds? We’ve redone our entire icon set and UI. We looked hard at Android’s guidelines for ICS and worked to make DejaOffice as consistent as possible without losing key business efficiency on the mobile form factor. 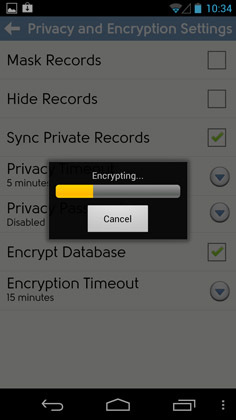 That’s why we’ve added full database encryption in DejaOffice. We don’t just encrypt select data types like notes. The entire DejaOffice database that resides on your phone is encrypted and locked. You can choose from a pattern-match challenge or an alpha-numeric challenge to unlock the database. DejaOffice adds swipe gestures that can be engaged for each record. Simply swipe from left-to-right on a Contact in DejaContacts to bring up a useful Quick Action menu. Our tests with Outlook.com proved something we suspected — Outlook.com doesn’t offer a way to truly add Google/Gmail Contacts. Instead, Outlook.com lets you view your Google Contacts within the Outlook.com People interface. You cannot edit or synchronize Google Contacts that you add to Outlook.com via Exchange ActiveSync to supported devices like Android, iPhone, iPad, and Windows Phone. 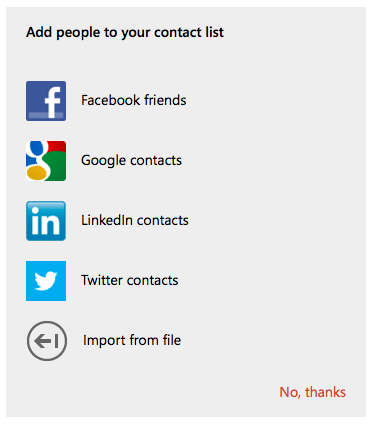 Access to Google Contacts and adding are very different. Here’s what the Outlook.com website shows you when you select People. Slightly misleading. But if you are looking to really move or sync Google Contacts into Outlook.com, download a free trial of CompanionLink for Outlook.com / Windows Live. It takes Google Contacts, Calendar, and Tasks and moves them to Outlook.com. For on-going sync between Google and Outlook.com, just buy a full license to CompanionLink. Gregg from Computerworld has a very informative technical article about the new Outlook.com service Microsoft announced yesterday. In his article, we noticed this little nugget. Outlook(.com) also syncs with Outlook 2013, the email client that’s part of the Office 2013 suite, which was released as a preview last month. It also synchronizes with the Metro-ized Mail app in Windows 8, although you’ll have to add your new Outlook.com to the app. People using Outlook 2010 or older will not be able to sync with the new Outlook.com service without extra help. This is because the Outlook 2010 client does not support Exchange ActiveSync. However, there is a way to do it. CompanionLink synchronizes Outlook 2010 contacts and calendar with Outlook.com. (We can’t sync email. If you need email sync, check out this) Set up CompanionLink for Outlook (free to try; $14.95 or higher to buy) to sync an Outlook.com / Windows Live account to Microsoft Outlook 2010. Here’s what your configuration in CompanionLink should look like. 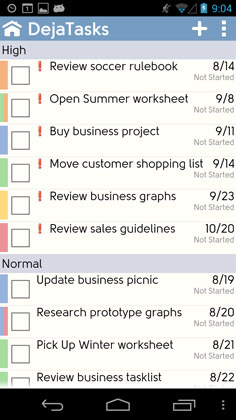 Early word from our R&D team is that CompanionLink will fully support Outlook 2013 Preview in our next software update. This means people can sync Outlook 2013 People (formerly known as Contacts), Calendar, Tasks, and Notes with the latest Android, iOS, Windows Phone, BlackBerry and webOS devices. You can also sync Office 2013 with Google, Gmail, and Windows Live accounts. We’re excited about Microsoft’s initiatives to merge the cloud with desktop platforms. CompanionLink is looking into ways to sync directly with Office 365. Please bookmark this blog post and we’ll update it as we learn more. There is lots more to come. Our new tabbed interface gives you a quick way to see all interaction you’ve had with someone. Find and tap on a Contact. You will see a summary about their vitals (name, company, email, phone), followed by three tabs – Details, Notes and History. 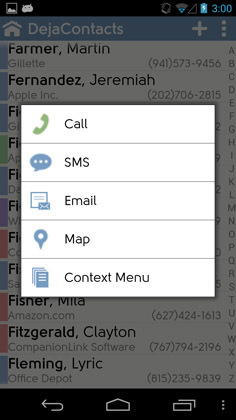 Tap on Details to get information about all the secondary contact fields. Things like Fax, Birthdate, Email Address 3, etc. Tap on Notes to read all Contact Notes you’ve entered for that person. Tap on History to see all memos, text messages, pictures, and phone calls you have linked to that person. In a future update, DejaOffice will also log calls (both placed and received). Think of the History tab as a ledger of all your interaction with that person. The Verge recently did an excellent write-up on StyleTap’s app that emulates Palm OS on Android devices. CompanionLink pays much reverence to Palm OS because we got our start with that platform. However, we’re a strong fan of adopting the new Android OS instead of fighting it. 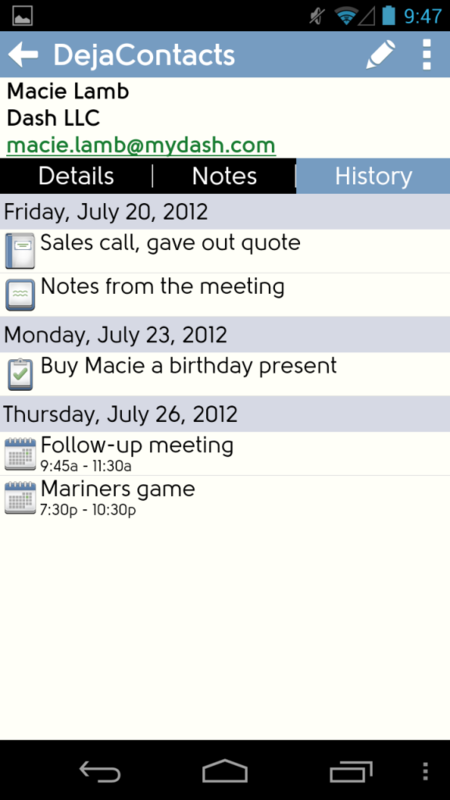 Palm OS had simple and functional capabilities for business contact management, calendar scheduling, task management, and note-taking. 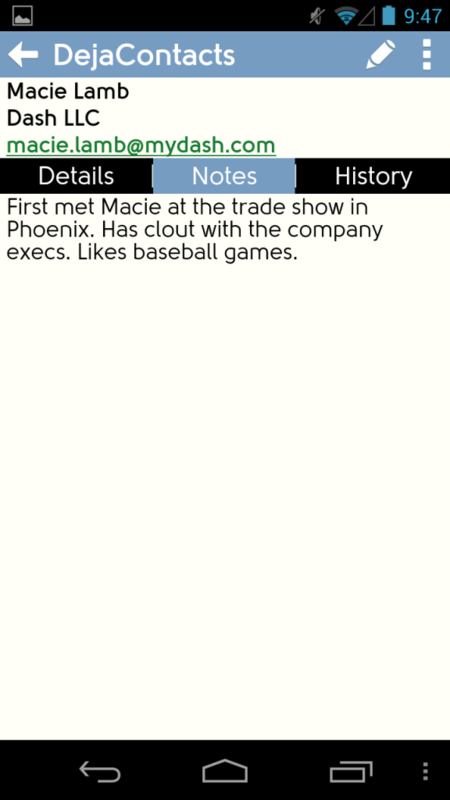 We have developed a PalmOS-like business PIM/CRM app for Android. It’s called DejaOffice and is currently available for free on the Google Play store. The existence of DejaOffice is rooted in transforming Android devices into business CRM tools that mirror the simplicity and functional themes of Palm OS. As topping on the cake, we wish to also take advantage of the powerful features of today’s smartphones (GPS, location awareness, etc.). More info on DejaOffice available at www.dejaoffice.com. 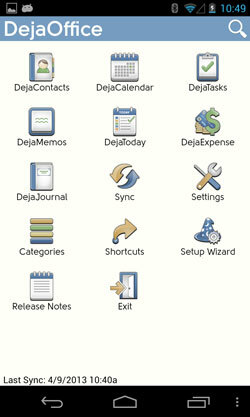 DejaOffice 2.2 configures as an Account on your phone. This means you do not need to sync DejaOffice with the existing Contacts accounts to get things like Caller ID to work. It just works! This is a big deal for people who previously had problems with the perception of duplicate data. The problem really stems from synchronizing DejaContacts to the built-in Contacts app on the device. When you did this, there were two sets of records (one in DejaContacts and one in the built-in Contacts app). You would get the impression that this was one set of data, duplicated. With our new account management feature, you don’t need to sync to the built-in Contacts app. 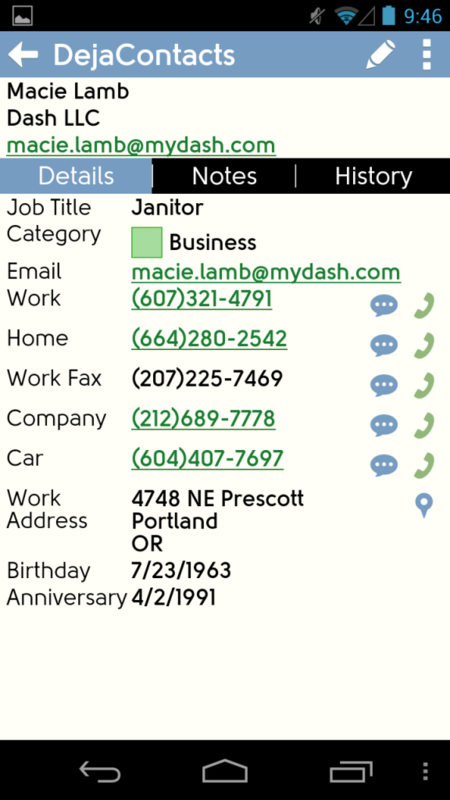 This eliminates the perception of duplicate data and cleanly keeps DejaOffice data in it’s own account on the phone. DejaOffice 2.2 will be launching towards the end of Summer 2012. To try a Beta version of the app, visit www.dejaoffice.com/androidapp and click the red button.